Do not give her the same old bouquet this year. Give her something that shows your creative side. 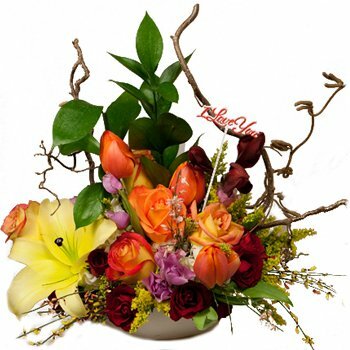 Our floral experts have arranged this unique bouquet of roses in shades of sunset and deepest red alongside dramatic tulips and Asiatic lilies in vibrant yellow and peach, and accented them with charming wildflowers, stunning greenery, and exotic branches. She's never seen anything like this! Ideal for Valentine's Day, birthdays, anniversaries, or any special occasion the Something Different Display says I Love You with flair.